So let’s say you ran a Facebook ad, announced your new arrivals in Instagram, or even launched an SMS promotion. Awesome, you made some sales! The problem lots of Shopify merchants see is people buying from the online store once and rarely coming back on their own. So it’s in your hands to nudge them into taking a second look. But how do you draw up an effective SMS marketing strategy that doesn't lead to sending marketing messages blindly into the world hoping that someone might click and order? One way is to send smart segmented SMS notifications after your customer has made a purchase in your store. This is a tactic you can use to ensure you’re sending your marketing messages to the most suitable recipients. 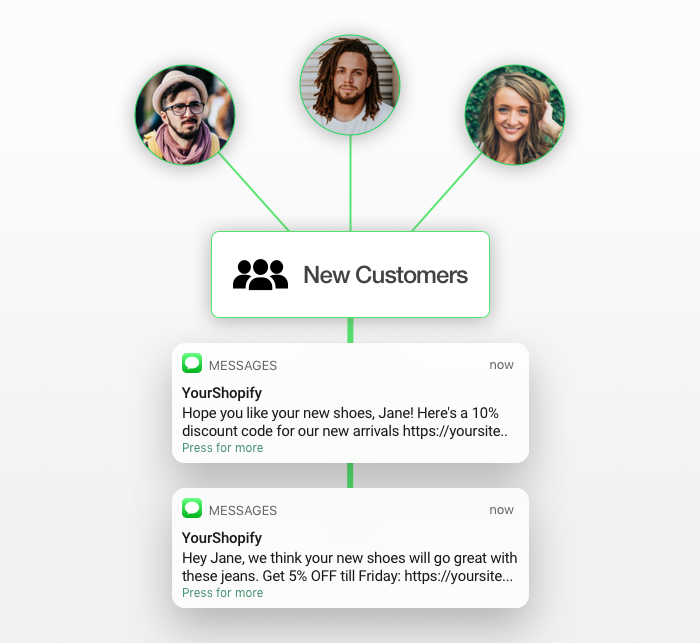 In this post, we’ll show you how to increase the new customer lifecycle for new buyers in Shopify by using SMS segmentation strategies to keep customers updated and sticking around. 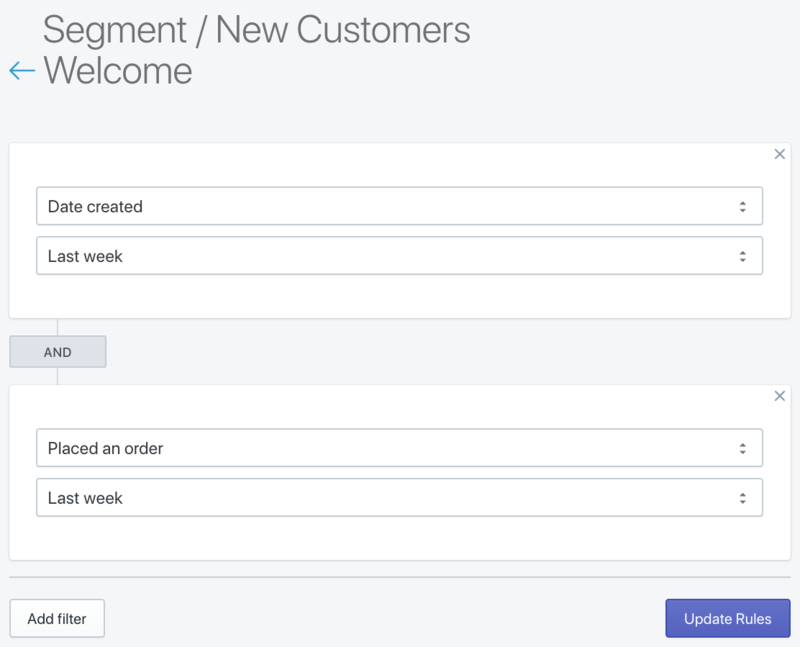 The great thing about the dynamic segments in SMSBump is that once you create a segment, it will constantly update itself to populate the relevant customers inside. 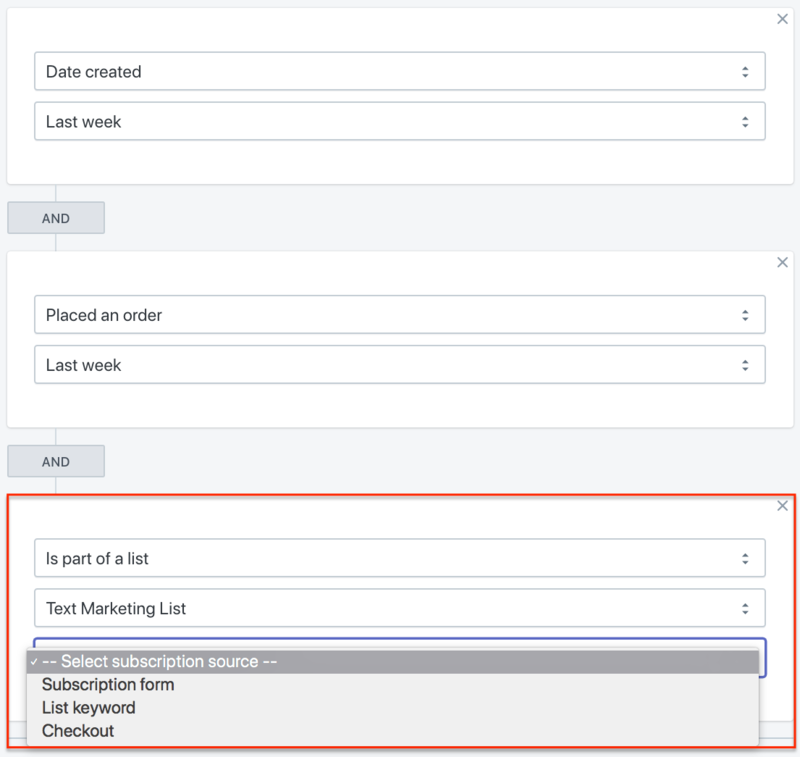 This means that using the Date created (Last week) rule will automatically populate the segment with all the customers who created an account in the last 7 days. The segment will always stay fresh containing just the customers who signed up recently. So, you have a segment of all the users who made an account in your store in the last week. Now add the Placed an order filter as you see in the screenshot above. This will narrow down your segment to the new visitors who made an order so you can get the actual new buyers. Great! Now you have a segment with all of the new customers who registered and purchased something in the last week. That’s great, since these people are likely already engaged with your store, so most of them might need just a little bit more proactivity from your business to become long-lasting customers. Or… you can take things to the next level and try getting more personal. You’ve completed step one! You have your new customers segmented. Time to go more specific and see how we can learn more about customers to make our text messages even more relevant to them. One way is to use the product interests of your new customers. What products did they buy in their first order? 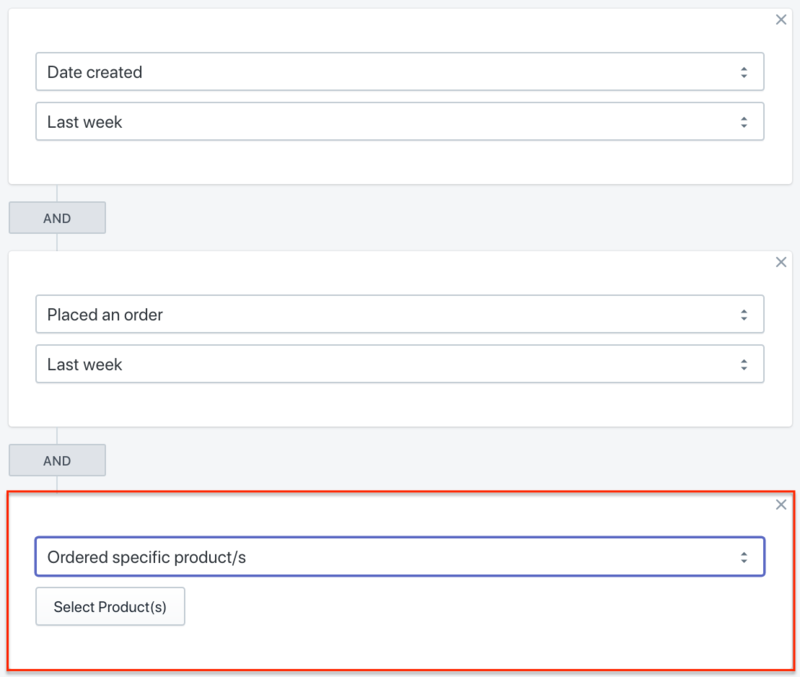 To add this, you can use the filter called Ordered specific product/s and select the products you want to promote again or better yet, use them for related product suggestions to send as SMS campaigns. This way you’re winning points for sending a message that’s much more relevant and relatable for your recipients. Using product interests increases your chances of converting from your text messages since it narrows the distance between your business and your customer, unlike a standard marketing message that’s designed for the masses. Knowing your customer’s product interest lets you craft messages that are original, personal and if you’re good enough - even make your customers smile. 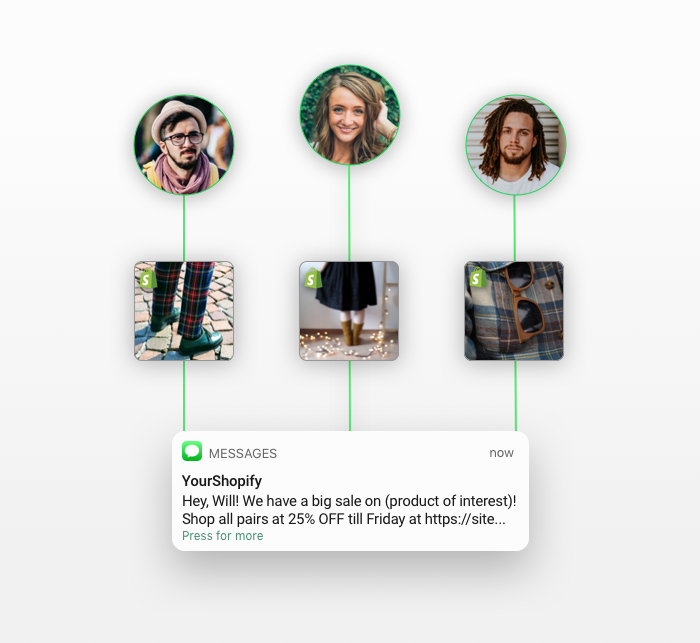 This is how you create different SMS campaigns relevant to how your subscribers signed up for your exclusive deals and offers. Often, you can just customize the welcome SMS based on how the customers signed up and then continue with the same on-boarding sequences for everyone. Messaging customers based on how they subscribed means you take a more personal approach to your audience. This is how you keep customers engaged with your consistent communication based on how they interacted with your store. The message focus should be on introducing your new subscriber to the website and draw their attention to the deals that will interest them the most right away, based on their source of subscription. Your new customers are your chance of creating a long-lasting relationship. SMS is one of the most personal and actionable means of communication to make it easier for you to draw new buyers closer to your Shopify business. Learn more about the different segment types here!